It’s Friday again, which means it’s time for another edition of The Friday Five! If this is your first time checking out The Friday Five, this is a feature that I post every Friday in which I give my thoughts on a topic that’s related to basketball video games, the real NBA or another area of interest to our community, either as a list of five items or in Top 5 countdown format. The Conference Finals are now underway, which means we’re getting closer and closer to crowning this year’s NBA Champion. With the start of the 2013 NBA Finals just a couple of weeks away, I’ve decided to count down my five favourite and five least favourite NBA Finals series over the next two editions of The Friday Five. This week, I’m tipping things off with the positive list, my Top 5 Favourite NBA Finals Series. Since the Chicago Bulls won six championships in the 90s and it would be very easy for me to just list five of those six series as my favourites, I’m limiting myself to just two Bulls titles in the countdown. Their spot in the countdown probably won’t be a huge surprise, but hopefully my three other picks will keep things interesting for everyone. 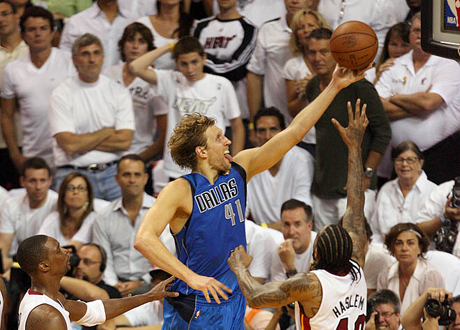 The 2006 Finals between the Heat and Mavericks probably doesn’t rank among a lot of people’s favourite Finals series…well, unless you’re a Heat fan. Some questionable officiating marred the series, but the Heat did still turn in an impressive performance (and had the presence of mind to attack the basket with the way the series was being called), while the Mavericks made some key blunders. As much as we love to do it, we can’t pin everything on the referees. As I mentioned in last week’s Friday Five, I was glad to see the Heat win so that Alonzo Mourning and Gary Payton could finally get a ring. I also enjoyed seeing Shaq win his fourth championship and Dwyane Wade win his first. As much as the series is mired in controversy, I still enjoyed watching it play out, partly due to the fact that it was one of the rare times in league history where neither Finalist had won an NBA championship, ensuring that we’d see a team win their very first title. Because of the long and storied rivalry of the Boston Celtics and Los Angeles Lakers, it’s always special when the two teams clash in the NBA Finals. Even regular season games between them are more meaningful than usual when both teams are up there among the league’s elite. 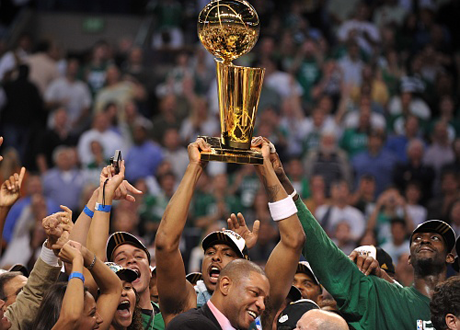 The 2008 Finals marked the first time the Lakers and Celtics had squared off for the championship in 21 years, officially sparking a long overdue renewal of the NBA’s greatest rivalry. As I prefer the Celtics to the Lakers and being that Kevin Garnett has long been one of my favourite non-Bulls players (yes, even with his run-ins with various Chicago players over the years), I wanted to see Boston win. There was also something special about seeing the team with the most NBA titles finally add another Larry O’Brien trophy to their collection, in the process changing the answer to a common NBA trivia question for the first time in a couple of decades. With their comeback from 24 points down in Game 4 and their 39 point victory in Game 6, KG’s words certainly rang true; anything is possible. 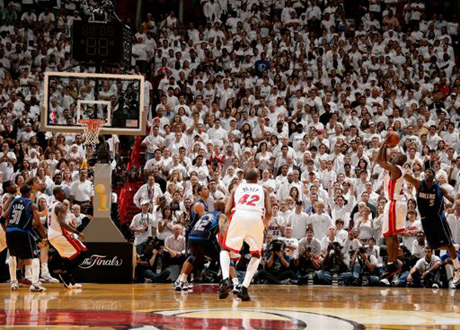 While I wanted to see the Heat prevail over the Mavericks in the 2006 Finals, the 2011 Finals were a different story. This time around, I wanted to see Dirk Nowitzki and Jason Kidd get a ring, not to mention that it felt more natural to cheer against the Heat as a result of The Decision and the bold proclamations of multiple championships, as well as Miami’s growing rivalry with Chicago. Putting aside the fact that the team I wanted to see win did in fact prevail, we saw a very entertaining series that included a huge Mavericks rally in Game 2, Chris Bosh hitting a big shot in Game 3, clutch performances by Dirk and Jason Terry, three straight games decided by three points or less and only one game that was decided by double digits. It was a great NBA Finals series to cap off a great 2011 season. And so we come to the top two. You probably figured out that the two series featuring the Chicago Bulls would own the top two spots in my countdown before you even read number five, but the question is, which two would I pick? Well, the first is their 1992 series with the Portland Trail Blazers, in which they won their second NBA championship. The series began and ended with two very different games. 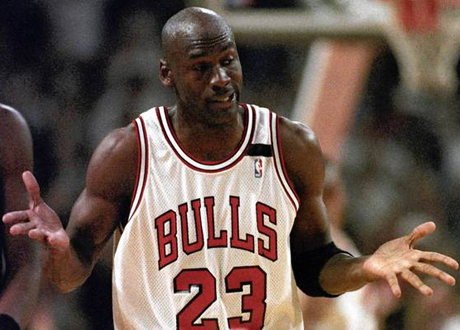 The first, Michael Jordan’s infamous “Shrug” game that would later be recreated in NBA 2K11, was a dominant Bulls victory with an historic performance by MJ. 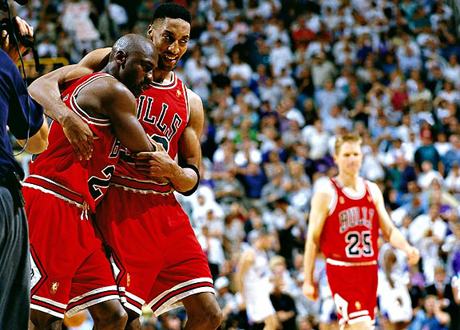 The title clinching win in Game 6 was hard fought and won thanks to a furious fourth quarter rally led by Scottie Pippen. In between, the Bulls and Blazers split four competitive games during which the “Dobermans”, MJ and Pip, played some great basketball. It’s a fun series for a Bulls fan like me to watch again and again, even over 20 years later. Coming in to this Friday Five, I knew that two Bulls championships would be ranked one and two in the countdown, but narrowing it down was a tough task. With the 1992 Finals against the Blazers ranking as my second favourite, I’m going with the 1997 Finals against the Jazz as my number one. For a Bulls fan, the series had everything. It pitted MJ and Pip against another great duo of the era, Karl Malone and John Stockton. 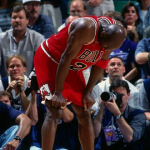 Jordan had an amazing series leading the team in scoring, rebounding and assists, knocking down a gamewinner in Game 1 and of course turning in another iconic performance in Game 5, The Flu Game. Then there was Steve Kerr’s big shot to put the Bulls ahead in Game 6, capping off a competitive and truly classic NBA Finals series in which Chicago captured its fifth championship. So, there you have it. My five honourable mentions are the Bulls and Jazz in 1998, the Bulls and Suns in 1993, the Bulls and Sonics in 1996, the Bulls and Lakers in 1991 and the Pistons and Lakers in 2004, rounding out my top ten. You may think that I’ve forgotten about some classic series like the 1976 Finals between the Boston Celtics and Phoenix Suns, but please remember that this is a list of my personal favourites, not an attempt at an objective list of the five best NBA Finals series ever. What are some of your favourite NBA Finals series? What would be your top five? Let me know in the comments below and as always, feel free to take the discussion to the NLSC Forum. Thanks for reading, please be sure to check out next week’s Friday Five where I’ll count down my Top 5 Least Favourite NBA Finals Series. It was definitely hard to pick against that one, but 1992 and 1997 do stand out to me for the reasons I mentioned. All six Bulls championships account for spots in my personal top ten, no question. yeah sorry…I would be very biased and choose 5 of the 6 Bulls championships XD….specially the 1998 finals with that steal and shot at the end of game 6….I heard Byron Rusell it’s still complaining. It’s tempting, but all the other series I mentioned are definitely in my top ten and I felt it would make a more interesting article if I limited myself to just one or two Bulls championships, challenging myself to pick between the six. The 91 Finals is number one in my book. The two biggest stars in basketball history, Jordan & Magic going head to head. I must admit though, sweeping Detroit right off the court was sweeter than winning any of the championships, god I hated them. lol…the bad boys….and to think “stars” today complain about rough and physical play when they get hard fouls….what would they do if they had to face the late 80s Bad Boys?…call the cops? Agreed. Physically speaking, LeBron could certainly hold his own in any era in league history, but hearing him complain about the physicality of the current Bulls does leave you wondering how he would’ve handled teams like the Bad Boy Pistons. I think the 91 Finals gets overlooked because it ended in 5 games but Worthy was hurting the whole series and he didn’t play the second half of game 4 and all of game 5, same with Byron Scott. The Bulls would still have beaten them in 6 but it would have been a closer series. The 91 Finals is when basketball really exploded in popularity. There was a handful of basketball fans in my school but after the 91 Finals EVERYONE was a Bulls fan. The 2011 Finals made me so happy, never had I personally witnessed such a comeback against such odds. I mean, they were loaded in Miami’s favor in my opinion. I had great doubt that the Mavericks would pull through and win it, but after game 2 I started to hope again. Personally, I think that’s the best Finals I’ve seen in 10 years or more since the 90s anyway.